This year, show your support for Red Ribbon Week by entering their annual photo contest! As a full-service third-provider and administrator of alcohol and drug testing, Test Smartly Labs proudly works with parents to educate them about the dangers of teen drug use. We encourage parents to work with their teens this week to find their motivation to stay drug-free and share their photo with the nation. Red Ribbon Week starts today, October 23, and lasts until Halloween. Red Ribbon Week is the longest lasting and largest drug prevention campaign in the United States. Red Ribbon Week serves as a way for communities and individuals to stand up for our children and teens through a commitment to drug prevention and education. Participants also pledge a personal commitment to live drug-free lives. In the end, our ultimate goal is to celebrate a drug-free America. Enter The Red Ribbon Photo Contest! Families: Decorate your home’s front door, mailbox, or fence and be sure to include a Red Ribbon (double-looped, like a bow on a gift) and this year’s theme: “Life is Your Journey. Travel Drug Free.” You can submit your photo here. Schools: Decorate your campus and include a Red Ribbon (double-looped) and this year’s theme: “Life is Your Journey. Travel Drug Free.” You can submit your photo here. 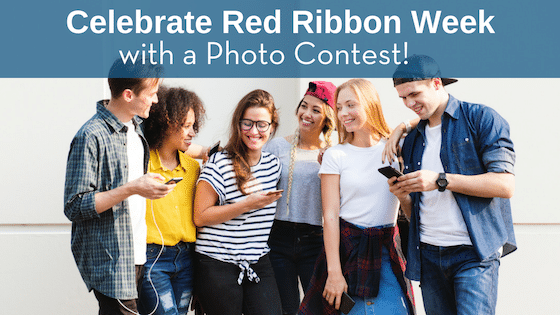 Simply take a picture of your Red Ribbon decorations, preferably with your friends or family, and submit the snap to the Red Ribbon Week before November 1, 2018. You need to be 18 years old to enter, so parents, teachers, or PTA members should submit the photos. It’s important to note that you can’t digitally add any details – all decorations much be authentic! Ask your friends, family, colleagues, and school contacts to VOTE for your photo at www.redribbon.org. The categories include Most Creative, Best Use of the Community, Best Use of Theme, Most Educational, and mroe! The last day to vote is November 16! The top 10 family entries and school entries that earn the most votes will win an iPad and $1,000 for a local K-12 school. If you have any lingering questions, check out the Photo Contest FAQ. Take the Red Ribbon pledge this week to fight back against teen alcohol and drug use. Test Smartly Labs is committed to providing safe and accurate drug testing if you suspect your teen may be under the influence. Our goal is to work with parents to create a drug-free America that’s safe for our children and our future. IF YOU SUSPECT YOUR TEEN OF EXPERIMENTING WITH DRUGS OR ALCOHOL, WE PROVIDE ACCURATE AND CONFIDENTIAL DRUG TESTING. CALL (816) 800-9699 OR CONTACT TEST SMARTLY LABS TODAY. YOU CAN MAKE AN APPOINTMENT AT ANY OF OUR 5 KANSAS CITY AREA LOCATIONS. LIKE us on Facebook for special alerts and announcements! Next ArticleHow Do You Know if Your Teen Has a Fake ID?